The guide is aimed at anybody involved in running or working in a sports club. It aims to break down one of the main barriers for people with a range of impairments – venue accessibility. 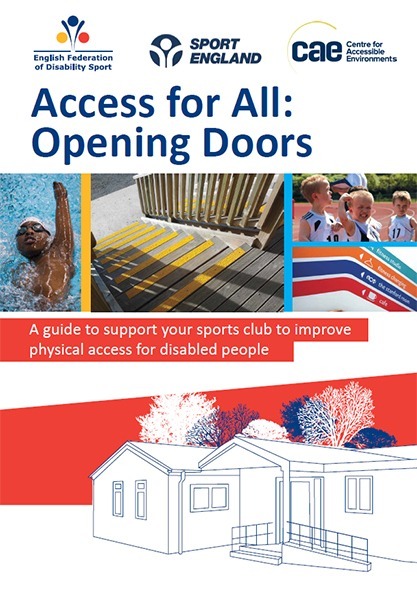 CAE’s Director, Jean Hewitt, was the main contributor and author of a 2015 EFDS guide to improve access for disabled people in sports clubs. The guide aims to break down one of the main barriers for people with a range of impairments – venue accessibility. As well as it making good business sense to be welcoming to a huge section of our population, there is also a legal duty to ensure sports clubs are accessible for disabled people to use. The Equality Act 2010 requires sports clubs and other providers to make reasonable adjustments to services so everyone has access, with no exemption for private clubs any more.